It’s a jelly roll cake, and I’m so excited to share this recipe! Every time I post one I have to mention that I find jelly rolls intimidating, and this cake roll was no exception. But as always, after gathering the tools and ingredients the process went from daunting to fun, and the end result was fantastic! Hopefully I’ll remember this recipe at Christmas because this cake would make a great “Buche de Noel. It really does look like a log — so much so that I might even attempt to make those little meringue mushrooms. Meringue mushrooms or not, this is a recipe you have to try. It’s been around since 1991 when it first appeared in Gourmet, but it’s changed over time. I discovered it in the yellow Gourmet cookbook where it was modified a bit more, and then I modified it yet again. The earliest version called for gelatin in the filling, but this cake certainly did not need it. And the earlier version had a much stronger coffee filling, but this version is just right. One more bonus is that this cake can easily be made without gluten. Naturally, you’d want to check the ingredient labels (especially the powdered sugar) to make sure the brand is gluten-free, but the cake is flourless so making this without wheat should be fairly simple. Let me know if you make it. And one final note. The cake is super chocolatey and not at all egg-y tasting despite the lack of flour. It does crack a bit as you roll it, but again — this make it look more like a log and is perfectly okay. 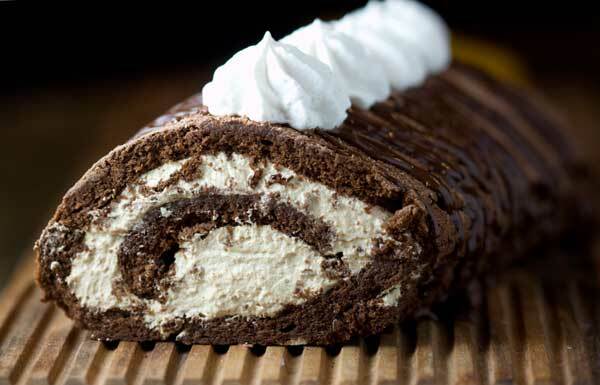 A flourless chocolate jelly roll cake filled with cappuccino flavored whipped cream. This recipe is simple but it does require special equipment. Along with a 15x10 1/2 inch jelly roll pan, you'll need some foil, wax paper, two mixing bowls and a saucepan. If you don't have two stand mixer bowls you can switch out, you'll need a hand held mixer to beat the egg whites. Line a 15 by 10 1/2-inch jelly-roll pan with foil. Spray the foil with cooking spray. Line the foil with wax paper and rub the wax paper with softened butter or shortening. Separate the eggs making sure that the whites have absolutely no yolk in them. Put the whites in one stand mixer bowl (use the smaller one if they are different sizes) and the yolks in the larger bowl. Set aside. In a saucepan set over low heat, melt the chocolate with 1/4 cup water, stirring until smooth. Let cool for about 10 minutes. Set the stand mixer bowl with the egg whites on the mixer stand and with the whisk attachment, beat on medium until they are frothy. Add the cream of tartar, and beat until soft peaks form. Add 1/3 cup of the sugar gradually and beat just until peaks start to hold stiff peaks -- don't overbeat. Remove the bowl of egg whites from the stand mixer and replace with bowl with the egg yolks. Using the same whisk attachment (no need to clean it), beat the egg yolks with remaining 1/3 cup of the sugar for 5 minutes, or until the mixture is thick and pale and ribbons form when the beaters are lifted. Beat in the salt, vanilla and melted chocolate. With a heavy scraper, fold the egg whites into the egg yolk mixture in 3 parts. Pour the batter into the pan and spread it evenly. Bake on the center rack for 12 to 15 minutes, or until it is puffed and just set. Let the cake cool completely in the pan on a rack. It will sink slightly as it cools. Filling: When cake is cool, prepare the filling. In a chilled mixing bowl combine the cream, the espresso powder, and the cinnamon and beat the mixture until it holds soft peaks. Add the confectioners' sugar and beat until mixture holds stiff peaks. Cake Dusting Mixture: In a small bowl stir together the cocoa powder and the confectioners' sugar and sift about half of the mixture evenly over the cooled cake. Cover the cake with a sheet of wax paper, then invert onto a baking sheet so that it sits on the wax paper. Peel off the foil and the original wax paper carefully and mound the filling lengthwise down the center, leaving a 1-inch border at each end. Starting at the short side, roll up the cake jelly-roll style, slightly lifting the wax paper to help guide the cake into a roll. It will crack slightly, but that is okay. Bring the waxed paper up and around the roll and chill the cake for at least 1 hour and up to 2 hours. At this point, I think you could freeze it as well. I will test that at some point. Transfer the cake to a platter, remove the wax paper, and trim the ends on the diagonal. Sift the remaining cake dust mixture over the top. Make the ganache. Put the cream in a small cup and microwave for 30 seconds. Add chocolate and stir until smooth. Let it cool down a bit -- it will thicken as it cools. Put it in a decorating bag or freezer bag, snip off the tip and squeeze decoratively over log. it will slip off the sugar, but if you let it thicken you should be able to coax it into sticking. Decorate with sweetened whip cream if desired. -- You'll need a whisk attachment to beat the egg yolks and egg whites. If you have two stand mixing bowls, you can use the whisk attachment for both. If you only have one stand mixing bowl you can use a second mixing bowl and a handheld mixer. -- For the garnish, I used the ganache as mentioned and some whipped cream that was leftover from something else. To make sweetened whipped cream garnish, you'll only need about 1/3 cup of whipping cream and a tablespoon of confectioners' sugar. -- If you are out of espresso powder and only have instant coffee, crush the instant coffee with a mortar and pestle and then measure out 1 tablespoon. Melted Cadbury bars? I need to try that! I think I’m going to fill my next jelly roll cake with ice cream. 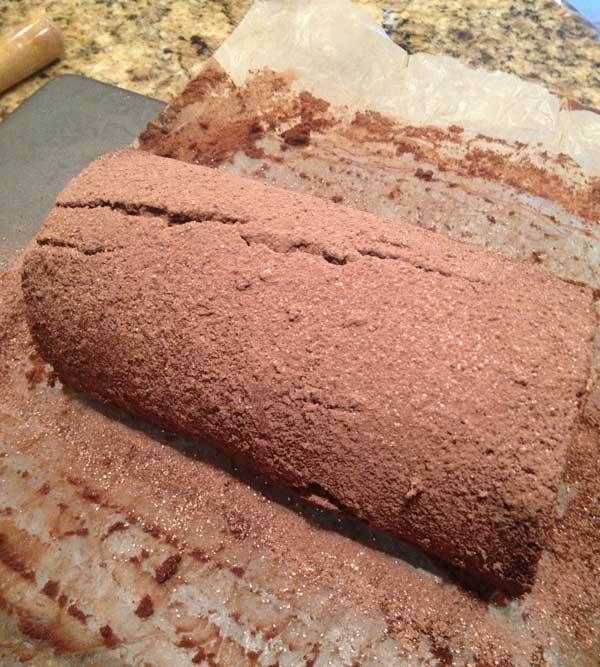 My mother made a variation on this, called Lincoln Log: a chocolate roll, filled with BARELY sweetened whipped cream and dotted with plenty of sour cherries, then rolled up and frosted with what was essentially melted Cadbury bars. Oh BOY! This is one of my all-time favorite cakes. Yours is beautiful! Excellent recipe! It’s even tastier than it looks! Great choice Anna! I’ ve just made it for tonight and can’t wait everyone to try it! Also very easy to make! Thanks for sharing it!